Pan measurements. So, I wrecked my 79' Targa a few years ago and I built a frame on which to pull it back into shape. I'm welding in a new left front corner inner fender and a new front latch panel and gasket channel. When comparing the right and left sides, the left wheelbase was about 12 millimeters or so shorter than the right and the body shop that did the insurance claim estimate reported that the left wheelbase was a little over a half inch short (apparently comparing it to the undamaged right side). Prior to pulling it, I took a measurement off my unwrecked 82' Coupe. I made up a steel measuring stick (couldn't fit my trammel under the car) and took my measurement from the lower bolt/boss for the torsion tube flange measuring to the aluminum crossmember/suspension bolt center (the front datum line for a Rear Floor Plate - Auxiliary Support measurement). The body shop seemed pretty confident in the measurement of the right wheelbase but this measurement came in at about 10 or 11 millimeters shorter than the same measurement on the coupe. The left side came in at around 20 millimeters shorter than the coupe. So, I took a pull with the idea of matching the coupe and it came out pretty well, but only to the point that it matched the right side. So, by comparison, this would place both sides as about 10 or 11 millimeters shorter than the same measurement on the coupe. So, my plan was to make some cuts in the pan on the left side to facilitate the pull and then take a pull on the right side to get them to match the measurement on the coupe. However, rather than doing that, (since both sides now match) I decided to take the diagonal measurements from the floor pan to the datum lines. I took the Rear Floor Plate - Auxiliary Support measurement (73½"+/-⅛) and the Floor Plate - Control Arm Mount (52¼" +/-⅛). To my surprise, all four (4) measurements appear to now be within tolerance. WTF? How can this be when the coupe seems to show a half an inch more length when measured from the flange boss? Are the boss placements inconsistent? I thought something was funky when I would pull the left side and it would spring back to match the right side after pulling out the difference. Should it match the coupe or should I be confident in the factory measurements? One thing, I have not taken the same measurements on the coupe (from the pan measuring holes). i do have the measurements for all the chassis's but they are at my old body shop and i'm not heading over there any time soon. i do have these two on hand so they will give you an idea of how the chassis are measured. we used celette bench's so the car would sit on fixtures making a data sheet worthless to us. the celette bench is great because celette did all the engineering calculations such that the car when properly placed on the fixtures would be on plane and centered. your car has been pushed back 1/2" or so . it is probably not on plane any more. measuring is not simple it takes a lot of diligence to get it right. in your case you will need to find center of the car back at the rear engine mounts. set those mounts at a known equal elevation .then at the trans mounts find center line and do the math to elevate both mounts to the same plane as the rear engine mounts. now if the rear was ok to begin with, never disturbed …. the forward mounting points of the steering rack will be were you find an error. what you want is to find the center line at the steering rack and mathematically elevate both sides to the same plane as the engine and trans mounts. once you get these three stations in sync you can then move forward to the front a arms. once again find center / or find the factory width and use your center line that you have carried forward. elevate these arms to the hight that puts them on the same plane as the rest of the car. you cant use a concrete floor or even steel beams to establish "level" you have to apply yourself to be assured you are on one plane. Last edited by bobrestore; 04-16-2019 at 11:18 AM.. I'm using a water level. I leveled the beams prior to mounting the car, and so forth. Thank you both for responding. Any idea why the diagonal measurements would be correct but the measurement appear to be a half inch short compared to the Coupe? I am using the dimensions and measurements from the factory manual. However, I have not check the diagonal measurements on my Coupe. The Targa was a one owner car when I purchased it and the lady had about 44K in receipts. Thing is, there was a receipt for a minor fender bender on the right side. That didn't bother me too much. However, when began working on the driver side, bondo came off of the rear inner fender. It had filler with a healthy coating of Wurth Grey Stone Guard sprayed over it. I am replacing the front inner corner, latch panel (shout out to the great folks at Restoration Design) and the front half of the battery tray. So, when I wire wheeled off the stone guard and paint on the pinch weld (at the left front lower corner), I discovered what appears to be some crappy reweld work and grinding. It has ground down plug welds, rather than the original spot welds. All I can assume is that I didn't receive the receipt for the left front hit. When I had my little accident, I drove the car home and it mostly just looked like the left front fender. However, the fender is pretty tough and it kinked inward at the shock tower. I built a jig and spread the shock towers back to spec and straightened the flange for the left fender. After leveling the rear, I discovered that the left front was high. This would explain why the car could lock up the front wheel during hard breaking. The car had been leveled rather than corner balanced so while it appeared level, the left front was unloaded/light. When leveled on the jig, the right strut travel was about an inch and a half lower than the left (inch and a half more loaded). So, the car drove great (and straight) when I bought it and I'm not sure if an inspection would have caught the problems. The damage had been "built in" and painted over, as it were. Last edited by b00mslang; 04-16-2019 at 03:33 PM.. I have never used water level. I have see others use it. I am retired Operating Engineer and did layout and shot grades with lasers. bridge abutments wing walls etc.... I am curious.. how accurate would water be. say your water in the morning is 50 degrees and in the afternoon 75 degrees.... can you see the miscues down to a millimeter. Interestingly, I went through Local 12's apprenticeship program (as a mechanic) but wound up as a sailing Chief Engineer. Back in the day, a lot of batch plants had Operating Engineers as well. Temperature/density appears to have no effect on the water level. 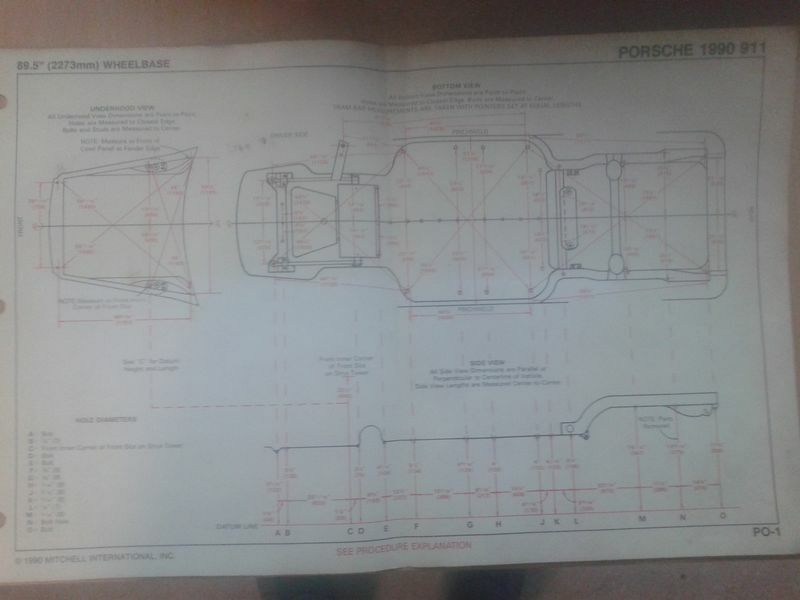 Last edited by bobrestore; 04-17-2019 at 09:58 AM..
so your using the beams set as you flat level datum line and you have mounted the car on the beams so how so the beams and the car mounted are rock solid? 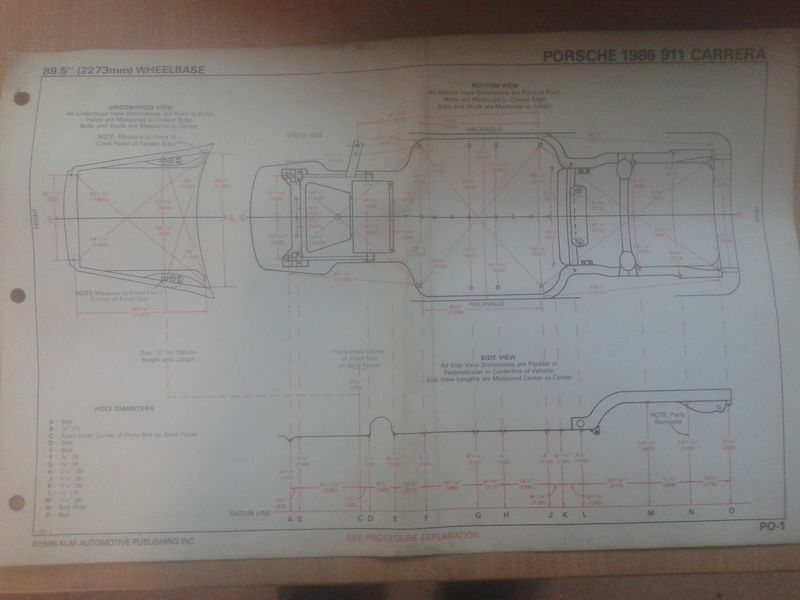 taking the measurements for a different car when you have the spec sheet for your chassis in front of you makes no sense to me you go by the spec sheet not another car. from the point of your car being mounted on a bench you then start taking your measurements. a tape ruler will not work! to take the proper measurements you will need a tram gauge. the reason is a tape ruler will bend and flex giving you a faults reading. when we only have a light pull on a car we will use a drive on bench and set the car on the rocker clamps and just use a tram gauge. My diagonals measure within spec on the points from the torsion tube to the suspension/cross member bolts (Rear Floor Plate - Auxiliary Support). Now that I've pulled the left side, my diagonals from the datum holes just aft of the wheel wells to the inner forward suspension bolt are within spec (Front Floor Plate - Control Arm Mount). I am going to precede with repairs to both inner fender wells and right Smuggler's Box, prior to moving to the latch panel and front corner. My main reason for posting all of this is the difference I detected between the Targa and measurements of my undamaged Coupe. I don't see any reason why the Targa can now be within factory specs and have a half an inch variation between the rear flange bosses and the cross member bolts. They should be identical (or reasonably close). Last edited by b00mslang; 04-18-2019 at 12:59 PM..
just keep in mind that distance is only half of the problem. you have to have distance at the exact same elevation. and that elevation is the design elevation. Last edited by bobrestore; 04-20-2019 at 10:18 AM..